Marriage: Denied? Delayed? When? How ? Happy? S TEEPED in tradition, parents in India take upon themselves the onerous task of fixing a life- companion for their loving children. Almost all parents in India and Asian countries, who have consulted me did ask about the matrimonial prospects of their children. Their possessive instincts lead them to ask every detail, education, profession, wealth and complexion, in India or abroad etc. that could exasperate even the most tolerant astrologer. If permitted, they would even ask the address of the prospective companion to make matters easy for them. In all my travels in the West from Europe, USA to down Australia probably only 5 percent of parents asked about the marital life of their children. Parents allow them to choose their marital destinies. However the young men and women do come to ask questions regarding their matrimonial possibilities. The questions are: Is marriage indicated in my chart? When will I get married? Will my marital life be happy? Let us first state the rules to answer these questions from any chart. 1) The Significant Planets to be assessed are Venus, Jupiter. 2) The Significant Bhavas to be assessed are 7th, 5th, 9th , 12th. 3)The Planet that ranks 3 in the net Shad Bala ranks becomes the significant planet for companion and companionship. 4) The planet that ranks 4 in the net Shad Bala ranks becomes the significant planet for marriage and having a family life. 5) If the significant planets have positive energy, there is indication of marriage. 7) If the Significant Planets receive the energies of Saturn, Mercury and Sun, marriage is delayed. 8) The 7th Bhava is the most important. The 12th is next in importance. The 9th follows and then the 5th in importance for assessment. 9) The planet or the strongest planet in the 7th Bhava becomes the main indicator. The same principle is used in the other Bhavas as well. 10) If there is no planet in any of the relevant Bhavas, the lord of the Bhava becomes the indicator. 11)If the 7th Bhava has positive energy, marriage is indicated. If the energy is not very positive, but the other Bhavas mentioned have sufficient positive energy, then also marriage is indicated. 12) If the 7th Bhava receives negative energy, marital life could be unhappy. 13)If the 7th Bhava is highly afflicted by the natural malefic planets Mars, Saturn and /or Ketu and the significant planets are also weak and/ or afflicted, marriage could be denied. 16) The 5th Bhava becomes significant to decide the possibilities of marriage out of love. If there is a relationship between the 5th and 1st and/ or 7th Bhavas, there could be indication of love marriage, a self-chosen companion. 18) The period of marriage is the sub period and the sub-sub period of the planet or planets having significance and related to the Bhavas mentioned. 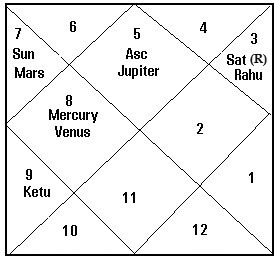 Rahu - Ketu axis in Gemini- Sagittarius, same in both Rasi and Navamsa. Drik Bala -13.69 5.25 -12.48 -8.19 -15.99 1.88 2.84. Min Req 165 133 96 165 165 133 96. Ranks 7 5 2 6 3 4 1. Significant planet Venus has a Natural Rank 3. In this chart Jupiter usurps that rank 3. Hence in this chart Jupiter is the real Significant Planet for companionship indications. These planets have sufficient positive energy to indicate marriage, but the aspect of Saturn to the Ascendant and Jupiter in the Navamsa indicates possibility of unhappy marriage (Rule 6). The aspect of Saturn on Jupiter and the ascendant indicates delay in marriage (Rules 7 & 15). The 7th house has no planets. It receives the aspect of Jupiter, which usurps the significance of Venus in this chart (Rule3 &4). This energy certainly indicates marriage. Besides the lord of the 7th, Saturn has an aspect on Jupiter and on the 5th Bhava. 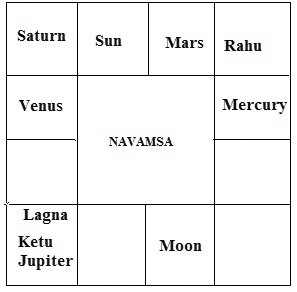 In the Navamsa, Rahu is in the 7th and receives the aspect of the significant planet Jupiter. Thus there is sufficient positive energy in the relevant Bhavas to indicate marriage (Rule10 & 11). 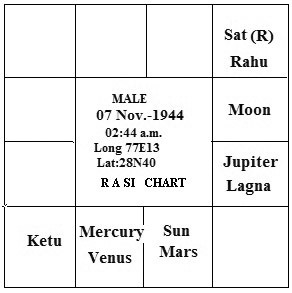 The 12th house in the Rasi has Moon, the lord in its own sign. However it moves to the 11th Bhava, where Rahu and Saturn are situated. In the Navamsa, Mars, the lord of the 12th, is in the 6th and receives the aspect of Saturn. This indicates the pleasure and comfort in marriage is afflicted (Rules 6 & 12). We have seen that there is delay in marriage and the chief negative energy for the same comes from Saturn. This indicates that in spite of a lot of positive energy indicating marriage, there could be delay till at least the 30th year. He would be in Ketu Dasa from about the 25th year of age. Since Ketu is in the 5th and in the Nakshatra of Sun, the ascendant lord in the Rasi and is in the Ascendant in the Navamsa, this Dasa indicates the possibility of marriage. 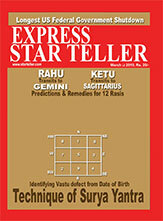 The Sub period of Rahu starts from about the 28th year of age. Rahu in the seventh in the Navamsa makes it significant Sub Period. The sub - sub periods of Sun, Moon and Mars, which he enters from 30th year of age could prove the significant periods for marriage (Rule 14). We have chosen Sun, because it is the Lord of the 1st and is in the Nakshatra of Jupiter and associated with Mars lord of the 9th in the Rasi. It is fifth from the Sub period lord Rahu. It is in the 5th house and receives the aspect of Jupiter in the Navamsa. Moon sub-sub period is also a possibility as Moon is lord of the 12th and moves towards Rahu, the sub Dasa lord in the eleventh house. 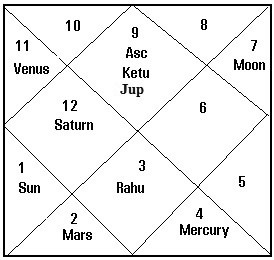 It is in the Nakshatra of Saturn lord of the 7th. The sub- sub period of Mars is another possible period, as Mars is the lord of the 9th and is associated with Sun, lord of the first. It is fifth from the Sub period lord Rahu. In the Navamsa it is lord of the 5th and 12th. These three sub-sub periods extend from early to middle of 1973, when the person is running the 30th year of age. Hence this could be the earliest possible period for marriage (Rule 18). In the Rasi, Jupiter is the lord of the 5th house of emotional and sentimental affairs. It is in the Ascendant, having an aspect in the 5th and 7th. In this chart, it is the planet that usurps the power of Venus, the planet-signifying of the life-partner. In the Navamsa also, Jupiter is in the Ascendant and has an aspect on the 5th house, where Sun, the lord of the 9th, is situated and exalted. This shows the possibility of marriage out of love or a self-chosen life partner (Rule 16). In the above analysis, we have found that married life is not likely to be happy. The prominence of the energies of the 12th house and Saturn indicate a kind of coldness and mechanical living. Lack of proper communication could also be a barrier to happy companionship. Facts of the example: The person chose his life partner, much to the dislike of the family and married her on 11th April 1973. The marital life has all through been very unhappy. The subject of Marriage has also other important questions. Will there be a divorce? if so will there be remarriage? Will we have children? If not can we have through medical means? Should we adopt a child? The astrological rules to answer these are also clear and specific and will be dealt in my next part. I request my learned colleagues to put to test the rules mentioned in this article in their regular practice and assess the percentage of accuracy. 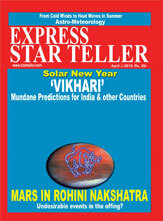 That would be a great contribution to establishing Vedic Astrology as a science. We owe this debt to the profession, through which we make our living. If the rules are validated, we shall salute Maharishi Parasara. If not I will in all humility accept my knowledge is imperfect.